Anyone in the market for a top point-and-shoot camera is probably deciding between Canon's S100 and Sony's RX100. 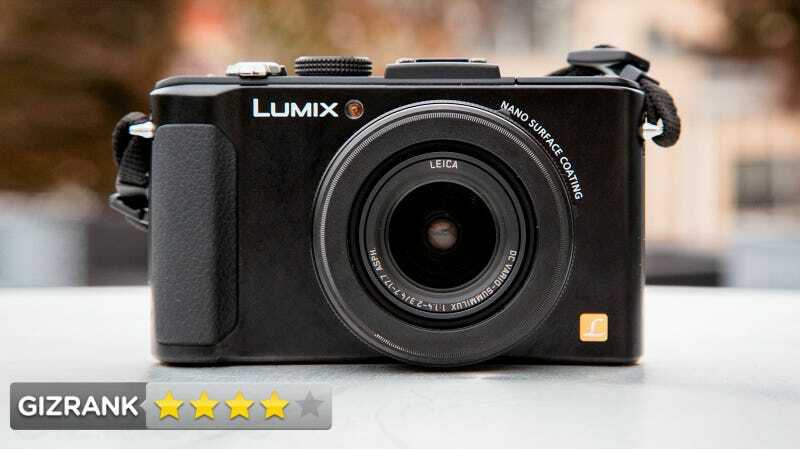 But Panasonic is back in the game with the Lumix LX7, a sequel to one of the top shooters of 2010, the wildly popular LX5. Does Panasonic's latest have what it takes to beat these pocket titans? A $450 compact camera with a 1/1.7-inch image sensor and a lens that opens up to an aperture of f/1.4. People who want stellar quality from a point-and-shoot, whether it's set on auto or dialed in with manual controls. Very solid and very comfortable to hold. It won't fit in your pants pocket, but it'll fit in a jacket. There are there are a lot of physical controls and the LCD screen is bright and clear. Sucker is fast. It locks onto a focal point, lightning quick, and fires off shots instantaneously. There are physical manual controls for just about everything, which means you rarely have to dive into a complicated menu to tweak your photo settings. We love this. That little sensor. The trend is toward larger sensors in smaller cameras (the RX100 has a one-inch). This 1/1.7-incher just ain't enough, even with that remarkable lens. In fact, the lens is wasted on it, leaving you to imagine how amazing and noise-free those low-light photos might have been—or if this camera might otherwise have beaten the Sony. On the barrel of the LX7, there's a ring to change the aspect ratio. That's fine, but it seems unnecessarily prominent for a rarely-used feature. Bury that in a menu and use the space for something else (like a real focus ring). Love the manual controls. There's an aperture ring, a switch to pull focus, a dial for shutter speed, and ISO is just a button-press away. There's also an AF/AE lock. In short, it's among the most easily adjustable point-and-shoots we've ever used. Hate the removable lens cap. It delays you from taking a photo, and it's easy to lose. The focus toggle is a great addition, but it certainly isn't as easy to use as a ring focus. The LX7 has the best color accuracy of any point-and-shoot we've tested. Colors are bright and vivid, but not over-saturated. Landscapes look amazing with it. Low light photos are a mixed bag with the LX7. Because that little sensor can only handle so much information, when it gains-up, it gets extremely noisy. Your images will be brighter than the S100 shooting at the same speed/ISO/aperture, but noisier. The RX100, with its big sensor, handily wins the low light contest. The on-camera flash is pretty good (for an on-camera flash). Very bright and even. But a photo still has that amateur look...like it was shot with an on-camera flash. 3.8x optical zoom is a bit ho-hum, especially when compared to the S100, which has 5x in a smaller package. It's capable of full-resolution bursts at 11 shots per second. Fast. It has a neutral density filter, which is rare for a camera in this class. Great addition. Very likely. The LX7 has placed itself squarely in the middle between the S100 and the RX100, in terms of both price and performance. The S100 is slightly cheaper (by 20 bucks) and way more pocketable, but photos aren't quite as good. The RX100 is more expensive (by 200 bucks) and manual controls are way worse, but that big image sensor just sops up light—so if you're going to be doing a lot of low-light photography, then it might be worth the extra coin. The LX7 shoots beautiful daylight photos, and fairly decent ones in low-light. It has really nice depth-of-field for a camera this size. The manual controls are extremely handy for getting your shot just right—but there's no shame in using this camera on auto. It performs wonderfully, and it's a lot of fun to use.